My wife and I lived in Concord for 26 years and recently moved to Benicia. We removed all the lawn at the Concord house and replaced both the front and the back yard and replaced them with dwarf fruit trees and raised vegetable beds. 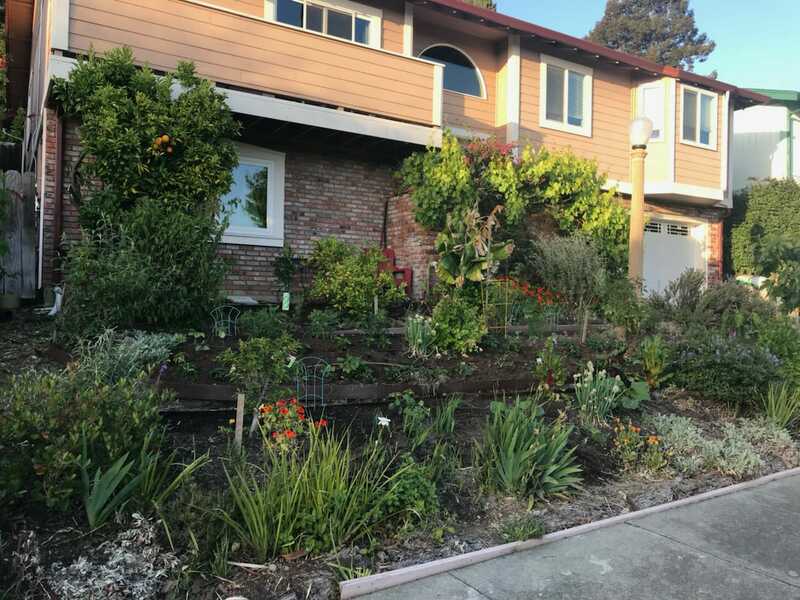 On March 2013 we moved to Benicia – and within months removed the lawn from the backyard and have replaced it with raised gardens – growing mostly vegetables. The front yard, which is now our food forest, was a very unattractive and unproductive ornamental landscape that was out of control. We enjoy gardening and often our garden is the center of our entertainment for friends. We also like to eat from the garden as much as possible and enjoy sharing our produce with friends. We saw this as a way to expedite our plan of replacing our front yard with a productive, easily accessible yard that more reflects the two of us. We were also interested in learning more about permaculture. 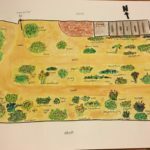 Originally we had planned to put in a mini orchard – but after learning more about food forests and permaculture we found this better suited our home. The installation began with coffee and light refreshments, and preparation of the site by David. After digging swales and following more instruction, we had lunch and then planted the yard. The installation far exceeded our expectations. Not only was a lot done in a short time, we also got to meet many other people that share our passion for gardening. We also learned more about swales. Finally, we celebrated by toasting the avocado tree with champagne. It was a great day of learning and fellowship. We are putting in tanks to save rainwater and may build natural rock walls on the upper side of the swales to give us more growing area. We also plan to dig up the ditch that makes up the upper swale and put a perforated pipe with gravel, and cover it again in wood chips to better spread the runoff from the backyard to the front yard. See a gallery of Marina Place’s Food Forest photos here.